Great front porch designs are not created by happenstance. Gregory and his wife, Holly, founded Vintage Woodworks in 1978 to recreate old-fashioned, handcrafted wooden mill work for both interior and exterior uses to enhance the look of almost any front porch. Vintage Woodworks is one of our fine sponsors. Gregory is a foremost expert on porches, from designing through building and has a wealth of knowledge and experience to share with others for creating the "perfect porch". They have been featured in HGTV's magazine and other wonderful publications. 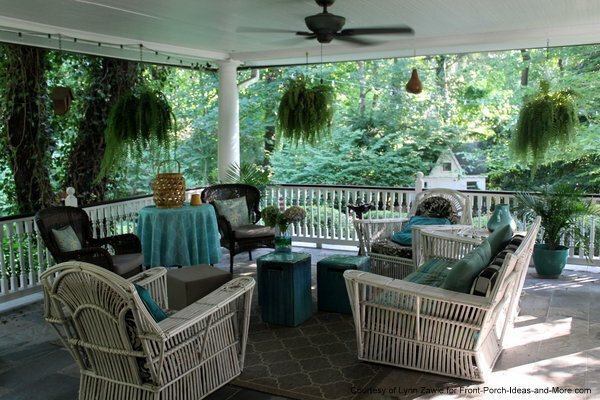 Gregory is passionate about porches and shares his ideas in a captivating style! Mary: Dave and I are very excited to have Gregory Tatsch, owner of Vintage Woodworks, on our porch today. Vintage Woodworks was founded in 1978 at Gregory and Holly's (Gregory's wife) kitchen table to reproduce old fashioned solid wood handcrafted millwork. So they started with just a few items. It has grown to produce hundreds of items to enhance your front porch's design and home. So welcome to our porch, Gregory. Gregory: Thank you, Mary. It is really nice of you to invite me. Those of us here at Vintage Woodworks consider both of you to be expert sources for porch information. 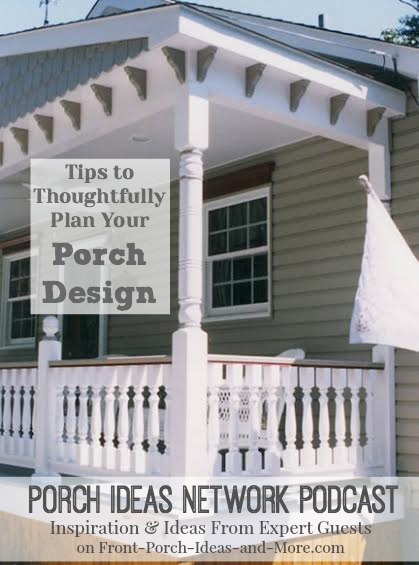 And since we have been helping people with porches for 36 years now, it is always fun to talk with others about porches and we are happy that you are going to be able to share our porch experiences with those who are listening. Gregory: Well, I think porches are so important, perhaps even more so in this fast-paced world of ours because they do offer a place to unwind. And as planning a porch would be just right for one's home and for that person's needs, they deserve some pretty thoughtful consideration. Mary: They absolutely do. Well, Gregory your story about you and Holly starting your company at your kitchen table is fascinating. So could we just take a moment for you to just kind of take us back to 1978, when you and Holly started at your kitchen table and tell us what motivated you and inspired you and how you got started. Gregory: Absolutely! We had wanted a business of our own for sometime, so we had been very diligent savers while we worked in the corporate world. And we actually were retired for about a year and a half in our early 30s. And we knew the money would not last too long. So we started looking around for different possibilities, but at that same time I was working with a friend of ours and we were dismantling old houses. Both of us had an interest in architecture and both of us needed lumber for some building projects. So we had this little casual lumberyard going we were selling a few things. Pretty soon we started noticing that things that we were already selling immediately were the decking items in particular, anything that had to do with the porch: the brackets, and the post and the spandrels and running trim and all of that. Well that did not take a whole of thinking to realize that maybe we're onto something here. So we looked around and at that time, of course, there was not an internet but we went to the library and did some research and we could not find anybody anywhere in the country that was reproducing the things that we've felt could really make a porch special. It was at that time and still is, a huge huge flea market not too far from where we were living. We would rent a booth and set up space and see what happens. Well, we sold out. Everyone that walked past said, "Gee, I didn't know you could get this anymore," and so that was really was a very casual start. I wish I could say I used my degree in business and did heavy-duty market-research. That's just not truth. But we were very glad that very early on we decided to go mail order. We would place these little ads in the back of magazines and we got an amazing amount of response. We had this little catalog printed out. We were mailing that out to people that requested one. One thing led to another and 36 years later here we are. Mary: Oh my goodness, 36 years! Dave: We have definitely seen increased interest than when we started our business regarding porches. 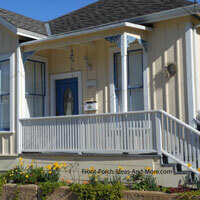 Contractors and builders have now started putting porches back on homes... and why do you think that is? Gregory: Well, I think it's driven by two factors. Number one, as I said a few minutes ago, I think that in our fast-paced world people are looking for a place that they kind of put their feet up here in the south, grab nice tall glass of iced tea, and you know just relax have some quality family time. But also I think simultaneous to this we went so far in the direction of making everything functional in a home but the outside became less and less appealing. And everything was built to a price. I think people in general, the public sort of rebelled that and they thought this is not like that the home I remember that my parents grew up in or that they even had. You know I want something that has a little bit of nostalgia to it. And if not nostalgic, at least it has some architectural style that I can identify with. And it's really as you know there's nothing better than the right front porch design to increase architectural style. In fact you can easily move your house in a particular direction depending on what you do with the porch so I think that's really what happened. People just realized the porch is too important not to have. Dave: Yes, we know subdivisions with zero lot lines and minimum space between the streets of the homes. Kind of limits how large a porch you can have. Gregory: That's true I also is way to expand what is generally a shrinking home that people are building smaller now days. And I think in general that's probably be the trend whereas the porch gives you a whole other room; as you know there's nothing quite like being out on the porch. Mary: I like what you just said about a porch is another room, because I'm finding that to be so true. Like at our home we have some rockers on our back porch and the swing and this is the place where Dave and I gravitate to in the morning, to have our coffee and just to start or day. But I think people are using it as another room. Gregory: Well, I think that really is the beginning point in fact. I would like to kind of slip in here. For anybody that might be listening I really feel the amount of quality time you spend in the initial planning stages and then later you work through the details. That in large measure is going to determine the success of the porch. And if you don't tune in on what your needs are you are not going to have a successful porch that you otherwise would. And there is something and we kind of touched on it without quite saying it. I think everybody needs to remember that first impressions are generally very lasting ones. And this is true with homes as well as it is with people. In fact, we like to say that the porch is a means by which your home says hello and welcome! Dave: That's a great point. Gregory: Well, you need to be thoughtful about what that porch is saying to the outside world. Does it grab the buyers as someone comes up to the porch. And I think it also missed an opportunity. So, yes there is definitely a need to consider what the porch is going to do and all porches come with a little bit of built-in functionally ready. For example, any porch serves as a transitional space. Not only is it connecting the inside to outside as we've been discussing. It offers the sanctuary and comforts that inside the home with the hustle and bustle of the outside. And it's really a nice place for children, and in our case grandchildren, to spend some quality time to curl up on the porch swing with a book to read them. Or if your hectic younger family could set aside a bit of time for porch time where people can relate instead of sitting in front of a TV. One of the uses that we thought we would have for our porch is that we wanted a pretty good size table out on the front porch. What we ended up with was a wrought iron table. Texas winds won't blow it off. It is generous enough that it can serve four to five people. But one of the things we discovered after we built an L shaped porch just as you did on your house, we do have pretty strong winds at times here. We positioned the table at the corner of the house. If we wanted more breeze we had to move the table, so we finally realized that after putting it right at the corner, the wind tells us to go around to the column side; if we got a light breeze, we go around to the breeze side, so that it really worked out well. We did not really catch the significance of building an L shaped or wraparound porch until we already built it. So that worked out well for us. 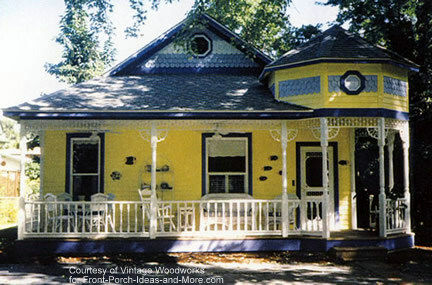 You know there is another thing I think that people discover if they haven't been living with a porch and all of a sudden they find themselves now with a nice porch. That is a marvelous window of Mother Nature. Not only is it going to shade you from the sun and protect you from the rain but as we discussed it provides protection from wind. And I think all of those things are things that go with porches. It just becomes such a meaningful part of your life. You know there are people and I'm certainly aware of this that they see the porch just mainly as added curb appeal to the home. There is nothing wrong with that. In that case you probably don't need a large porch. There are people that are just saying it is a covered entryway while you are fumbling with your keys. Nothing wrong with that either. But if you really want to live out on the porch, maybe even entertain larger numbers of people, a porch is an extension of the home as we've been discussing. Then the depth of the porch becomes pretty important. Mary: So just understanding how you going to use your porch plays an important role, doesn't it? Mary: Just yesterday, Dave and I went over to our son's home and they have a wonderful country style front porch design. I think is about 10 feet deep. And our granddaughter had her birthday party on the porch. We had it all decorated and it had a nice table out there, like you mentioned, and the girls made Fairy Gardens. It was really a fun family time. Gregory: Sounds very cool. That really underscores how you open up more possibilities when you have a deeper porch. And you do limit the types of things that you can do on a very shallow porch. We have a porch swing and there is plenty of room to walk behind or in front of it. Not with someone swinging. I would like to discuss for a moment the factor that we find quite a few of our customers are overlooking that in their initial plan; the relationship to the depth of the porch will have to the slope and to the height of porch posts. Those things are all very interrelated. Mary: I would just say that I would think just the average person would not have the knowledge to know even to think about that. Gregory: A deeper porch will, out of necessity, mean you would have a shallower roof pitch. It's the shape of a triangle where you draw one side the part of it that I don't remember from geometry is that it is a slope. Mary: That would be hypotenuse. Gregory: Yes, hypotenuse. The hypotenuse gets to be shallower and shallower angle. Well, why is that important? Because just about all common roofing materials require some minimum pitch to properly shed water. And so, if you are not considering that initially and the builder comes out, or worse yet, if you are building it yourself, and don't do anything about it until after the roof is leaking it becomes a major problem. Well, there's ways around it. To a point you can shorten the posts and that's going to achieve more roof eaves or if there are not any obstructions, you can start the back of the porch higher on the house wall. A lot of porches need to actually be started up on the main roof of the house and that sounds pretty complicated. You have to determine at what point it is going to start up on our roof and then you remove all the roofing materials. There are rafters where you can tie in the rafters to the porch. Dave: That really comes into play when you are dealing with ranch homes made a number of years ago. Older ranch homes typically have a low pitch roof to begin with. Gregory: Well, it is not that uncommon for our customers to actually end up with the type of low pitch roof that you are talking about, Dave. Put the roof of the porch starting way up at the ridge of the house, and I personally think it is more visually pleasing and you can show a little bit of break in the roof. But it is a big deal that your porch roof is too shallow, or you have chosen roofing material and all of a sudden you have a leaking porch. There is one other thing that is not seen very seen much anymore and it is maybe more appropriate for bigger homes particularly two-story homes. That is, if you have your heart set for an extra deep porch for living space at the back. You just can't put a porch over a window. That is just a big no no. But if you are fortunate enough to have several steps up to the front door of your house, it may work to drop the porch floor below the normal front door threshold level and then you can still have some steps, but now they are steps at the back of the porch up into the house. You will gain more vertical height from the back of the porch where you start down to the porch floor. Dave: That's a good point. Gregory: A lot of our listeners may not understand this as there is this inner play between post height, roof pitch and depth of the porch. And what I do when I am planning a new porch is I grab some graph paper and draw it to scale. I do make it to scale so I know I want this height porch post at least that's optimum and I want this depth and this is how high I can start my roof and then I measure my angle. If it is enough for what the roofing company says is needed I know I am in good shape. Or maybe I have to adjust. Dave: You also be aware of local building codes too because they often dictate the minimum slope that you can have in that geographical area because of ice and snow and all those kinds of things. Gregory: That's a very good point, being here in the south I tend to not think as much about ice and snow. But that is certainly a big factor and you know it is a factor also knowing what your frost line is when you are considering how deep to install footings. Dave: Great, what are some of the issues that customers bring to you that could have been avoided? Gregory: Well specifically where the roof is concerned, it's more a matter where they don't bring up the issue. That's why we train all of our phone reps to be generally knowledgeable on all these issues; so that we keep you from making a major mistake. And one of the things that will not be a mistake per se, but which depending on the house, are hip roofs. If you hip the roof then the porch roof is coming down to the porch eaves equally all the way around. Builders in the past I think were much more intuitive about that and knew that they wanted to maybe avoid that little triangle and depending upon the covering of the house siding the little triangle is not necessarily a problem. It is something that needs to be considered. Another thing that needs to be considered if you are building a new porch or maybe you got an existing porch you are perhaps replacing the roof anyway. 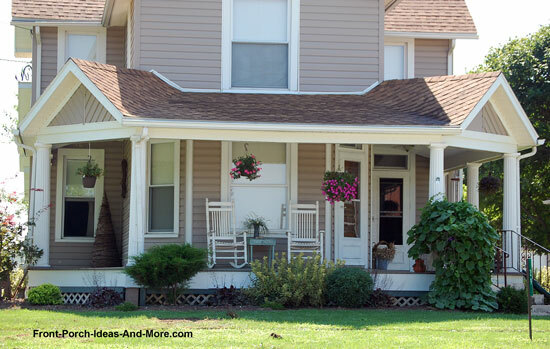 You can add a tremendous amount of charm to a porch by putting a little gable over the front steps. I am talking about a gable out at the front edge of the porch and then it dives right back into the porch roof which also means you got to have enough pitch to your roof. At our website we have a section of our own porch guide called porch roofs and it goes into considerable details of different types of roof designs and shapes of porches obviously. Dave: Very good, very good. Cost is always a factor. 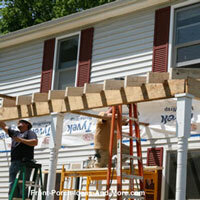 Do you have some ideas about how people can, when they are planning their porch, to minimize costs? Gregory: We actually like to point those things out to people, because we feel if we can make your porch affordable. One of the biggest things that you can do when there is a specific budget in mind is don't try to do everything at once. We are such an instant gratification society but you can put up the basic structure of the porch and do it well. Please do it well because you don't want to redo anything. And you can even have temporary posts for a while if that's what it takes but your neighbors might not like that so much. You don't have to go out and buy a lot of expensive furniture that same month. 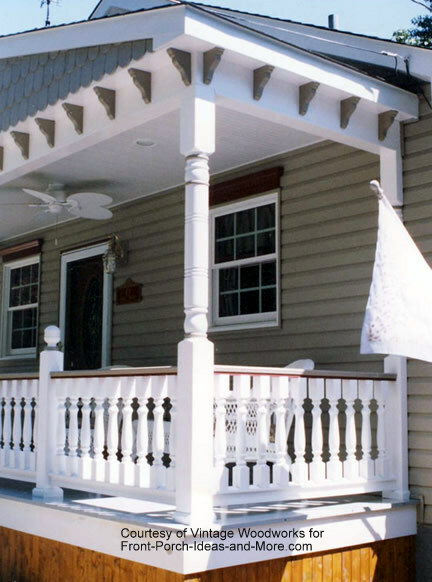 The brackets, spandrels, the running trim, and other things can be used to decorate a porch. We can just stop right at that point. You got a totally functional porch and you can live on it. Then as the budget permits, you can come back and buy that special table or the porch swing or add some spandrels up between the top of the post and other things to really bring the porch to the point where it is really beautiful. So that's a major thing you could do. One of the other things that you could do is realize that balustrades and by that I mean the handrails and the upright balusters as some people call them. Between the top bottom handrails those tend to be pretty expensive particularly if you were using anything other that a plain square baluster so what a lot of our customers would do. Go ahead and buy some decorations for the top of the porch, that is, at the top of the posts and between the post and not do the balusters if they don't need it for safety reasons. Now obviously if you have a porch that is way up off the ground or if you are building a two-story porch you've got to have proper safety. But if safety is not really a consideration and you can step off the edge of the porch and into the yard then you don't have to that balustrade right now. Hopefully you will do it eventually because even if you don't need it from a safety standpoint it adds so much to a porch. Gregory: Well you did a great job with it. But I am pointing these things out, as ways that you can spread the budget out and nowadays-plain square balustrade are really quite popular. So you don't have to go with a more expensive turn. Mary: Well , those are some fantastic ideas for everybody and before we close for today one other thing that I read about in your porch guide which is to build your porch to the depth that you would want but limit it's length. Well if budget is a consideration, I thought that was an excellent piece of advice. Gregory: I do think so because as you found out with your party yesterday a porch that's deep enough is really useful but a very long skinny porch, no matter how long it is you still have limited utilities. Mary: That's right. You have to walk around the chairs and you can't necessarily have a nice table with a less deep porch. So I thought that was an excellent piece of advice. Gregory: I am always trying to put myself in the thought process that I think our customers might have and right now I am in a thought process of "Gee, this is great stuff I can't wait to get started I don't even know to think about a porch with all these great ideas." There are two things. I want to suggest but perhaps the most important way is what I call driving around. I have been doing this for about 40 years and even before we started Vintage Woodworks we saw a lot of porches as long as I can remember. And even in our little town and certainly when we were in other towns. We take time to just drive around particularly the older neighborhoods because of the architecture. And what I do when I am really on my game is, Holly is our photographer in the family but I would have her step out of the car for a second and take a straight on photo of that house just from the street. Then when we get back home we print those out (black and white usually work real well for this purpose). But if I were planning a porch and that particular house was like my house and that's important when you driving around planning a porch, you are looking for houses that have the feel that your house has. I will take that and even if it has a porch I'll draw over it my ideal porch. You see I am planning at that point. If it doesn't have a porch I would have a clean slate on the printout just to draw stick figure on the porch. And you would be surprised after you've done that a few things how you begin to see things about porches you wouldn't have otherwise have realized. And it to me is a lot of fun so that is something that I think anybody can take advantage of with digital cameras, it basically costs you nothing to do so and then after you've done a couple of sessions of driving around photograph your own house. Again make it a straight on; make several black and white printouts and use a medium felt tip pen to start drawing different stick figures of your dream porch. And play with different aspects of it. You will be surprise that pretty soon you are coming up with a porch that you really like. I can do this design. As you know the amount of time you spend planning that's going to dictate your ultimate success. Mary: Gregory, we have loved having you as a guest today. Sitting on our porch and chatting with us. And we look forward to inviting you back because you have a wealth of knowledge on porches and we can tell your love of porches just like ours. So, Gregory, how would our listeners would be able to get in contact with you and your company? Gregory: Well, very easily. If they have online access our website is vintagewoodworks.com and what's there you going to find I think is a fairly well organized website and one of the areas that we mentioned in this recording is the online porch guide and will find a table of contents for that. So that will get you deeply into the kinds of topic and a lot more that we've been discussing. Our phone number is area code 903-356-2158. Mary: Very good, Gregory. It has just been an honor and a delight to have you today on our porch. Gregory: I feel honored to have been here. Mary: Thank you so much. Gregory's passion for porches is only exceeded by his desire to create the best products and customer service at Vintage Woodworks. What began at Gregory and Holly's kitchen table has grown into an amazing business that captures the beauty and nostalgia of a wonderful front porch. Gregory's exterior house trim can be used on almost any home and front porch. From simple column brackets to elaborate running trim, it is easy to turn any porch from ordinary to absolutely eye-catching beautiful! Contact Vintage Woodworks online at Vintage Woodworks well you'll find a well organized and a free online porch guide. You can also contact them directly at: 903-356-2158.